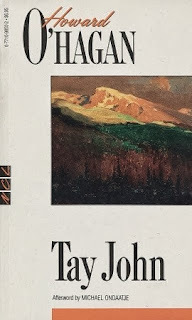 _Tay John_ is a woefully under-appreciated book that deserves wider attention. Written by Howard O'Hagan, a true son of the Canadian west who was, by turns, a surveyer, a lawyer, and a wilderness guide in addition to being a writer, it stands as a great example of wilderness writing at its best. As the Canadian Encyclopedia says: "O'Hagan has been the quintessential 'mountain man' who knew the wilderness intimately and celebrated it through fiction." In _Tay John_ we have a story in three parts. The first, "Legend", starts out like a creation myth and tells the somewhat cryptic story of the birth and youth of the enigmatic Native half-breed known as Tay John (derived from the french "Tête Jaune" or "Yellowhead" on account of his unique blond hair). We see the circumstances of his birth and his early life among his people, his eventual restlessness, and the beginning of his life of wandering. In the second part, "Hearsay", we focus on the outdoorsman Jack Denham and his tall tales of the heroic Tay John, whose path he crosses several times in the wilderness. We begin to see the wider shape of the world of the Canadian Rockies at the end of the 19th century as the civilization of the white man encroaches upon the wilderness that heretofore held sway. Tay John begins to get entangled in this new world and is torn between the opportunities it offers and the ancient prophecies and expectations of his native tribe. In the third and final section, "Evidence - without a finding", the conflict between the old and new ways of the world comes to a head and Tay John is caught in the middle. The end of his tale proves to be as enigmatic as was its beginning and the reader is left to draw his own conclusions about its meaning. The most outstanding element of O'Hagan's story is his descriptive prose. It's obvious that the man knew and loved the wilderness of which he writes and we see into the everyday lives and concerns of the men who preferred to live their lives on the outskirts of society, able to plunge into the wilderness when it called to them. His characters are also a colourful bunch, running the gamut of pioneers, explorers, preachers and trappers who peopled the Canadian west. We move from wide panoramic scenes of the mountains and the forests to a close focus on the individual lives of people making their way in this wide world. All in all, I found _Tay John_ to be a compelling and moving story that portrayed its world and characters with vivid detail and wonder.